Still well made. The /930 T12s were the last USA made Sylvania T12s in the 4' length. Interesting, I had no idea! Canada is still decent but I think I'll buy Philips from now on as my first choice for F40s. USA made in Salina, Kansas and 24,000 hour rated lifespan. The full wattage Altos aren't bad. The Sylvania 900 series T12s are the brightest on the market though. 3000 lumens for the above lamp. When did the USA F40T12 production stop? I know the Canadian ones have been around for several years now. Sometime last year. The Ecologic line was the last to go to Canada. Sylvania quality has been going down hill since around 2003. They redesigned the electrodes on their VHO lamps around that time and also started using smaller egg crates in their lamp boxes. They try to lower production cost and claim lamp quality hasn't suffered. Less packaging = more breakage during shipping. Smaller electrodes = less lamp life. These lamps have a good lumen rating but don't let that fool you, the mercury levels in these lamps are to low for proper function. My use of these lamps has been disappointing. They start up dim and mercury migrated and very flickery on magnetic 0.80A ballast and if used on electronic, they still do the migration and take forever to get full brightness. They also appear very orange on electronic ballasts. One of my test lamps became mercury starved before I switched them out. As it stands with the Canadian ones, the Philips CW Supreme lamps perform much better than the CWX Canadian Sylvania in brightness, colour and mercury. Supremes are 2600L, have a nice CW colour and start up full brightness each time in my light with no flicker or migrations of any kind. Too bad the quality on these is crap. In general I'm perfectly ok with stuff made in Canada. The earlier posts were saying the US ones were discontinued, and now the Canadian made ones too?...I wonder if the new US ones are actually manufactured by Sylvania? Or is some other company is manufacturing them? The recently reintroduced US made Sylvanias will be only for a short time. Ledvance decided to close the Versailles, KY plant this coming September. Ledisease is killing our jobs. So does that mean no more Sylvania fluorescents in general? Or is there another plant somewhere in the US or Canada that could take over? 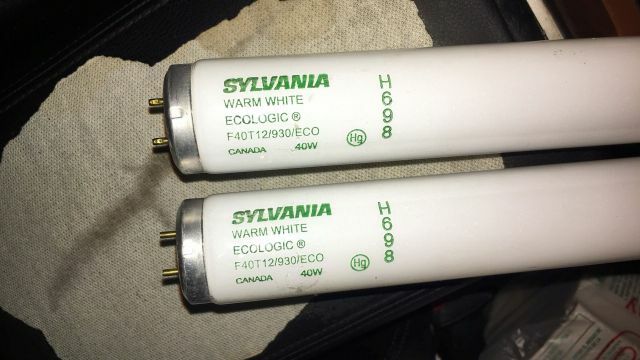 If Ledvance/Sylvania quits fluorescents...what does that leave(disregarding the off-brands like Industrial)? Just Philips?? - Source from another manufacturer. - Make them in China (highly doubt it). - Or stop making them completely. GE is also still out there. They still make fluorescents in the US. I thought I remember reading somewhere (in the past year or so) that GE was quitting the lighting business? Also kinda remember someone on here posting some new "GE" fluorescents at Lowes that were Philips made? I think you are talking about patricks photo and it was an F15T12 K&B but it was made in China .... lol . Really!? Sad that they are closing another American plant but not really surprising. They aren't opening a new overseas plant, are they? General Electric closed Circleville in 2017. Lamps produced there were outsourced, primarily to Philips, and included F96T12, F96T12/HO, and F15T12. Most other of the other U.S. GE fluorescent lamps are made at Bucyrus and were not affected. Some of the recently produced lamps have different end caps, but they are stamped USA and I believe they are still being made at Bucyrus. @jercar954 indicated the new caps looked Hungarian. It is curious that this style of cap showed up briefly on Sylvania lamps from Versailles, and now on some GE lamps presumably from Bucyrus. The Bucyrus plant was retooled several years back for expanded halogen and T8 production. Hopefully GE won't close it anytime soon. They are looking to sell the lighting division. Last I heard only the European division was sold and the Current division is about to be sold, but the remainder is with General Electric for now. Drop the lamp bans and let those of us that don't like led buy the lamps we want.